2011-04-26. New. Ships with Tracking Number! INTERNATIONAL WORLDWIDE Shipping available. Buy with confidence, excellent customer service! 2011-04-26. Good. Ships with Tracking Number! INTERNATIONAL WORLDWIDE Shipping available. May not contain Access Codes or Supplements. May be ex-library. Shipping & Handling by region. Buy with confidence, excellent customer service! 2011-10-15. New. Ships with Tracking Number! INTERNATIONAL WORLDWIDE Shipping available. Buy with confidence, excellent customer service! 1991-02-09. New. Ships with Tracking Number! INTERNATIONAL WORLDWIDE Shipping available. Buy with confidence, excellent customer service! Princeton University Press. PAPERBACK. 0691019037 New Condition. . New. 1991-02-09. Good. Ships with Tracking Number! INTERNATIONAL WORLDWIDE Shipping available. May not contain Access Codes or Supplements. May be ex-library. Shipping & Handling by region. Buy with confidence, excellent customer service! Literary Licensing, LLC. PAPERBACK. 1258117460 Special order direct from the distributor . New. Princeton University Press. PAPERBACK. 0691019037 Special order direct from the distributor . New. Princeton University Press. PAPERBACK. 0691019037 Like New Condition. . Fine. Anchor Books, 1958. Anchor A136, an Anchor original and first Anchor edition with 2.50 cover price and cover illustration by Leonard Baskin. A very good plus clean copy with light cover soil. 362 pp.. 1st Edition. Soft Cover. Very Good. Doubleday Anchor, 1958. Sturdy mass-market paperback, ornate colorful front wrapper, 363 pages. Light browning to wrappers, light crease at bottom front and top back tip, tiny nick at spine top right edge. Near Very Good.. Mass Market Paperback. Very Good. Garden City, NY: Anchor, 1958. Book. Good+. Paperback. 12mo - over 6¾" - 7¾" tall. 363pp, Edited by Violet s. de Laszlo. A selection from the writings of C. G. Jung. Cover somewhat darkened, but without marks or tears in text..
Doubleday / Anchor, 1958. Paperback. Very Good. Previous owner's inscription on end paper, pages are otherwise clean and unmarked. Covers show light wear. ; 100% Satisfaction Guaranteed! Ships same or next business day! Garden City: Anchor/ Doubleday, 1958. Book. Very Good. Soft cover. Reprint. 10400 shelf. Mass market paperback, partly stained back cover, red remainder mk bottom. Edited by Violet S. de Laszlo. No names, clean text. Leonard Baskin cover. 363 pgs. N.Y.: Doubleday, 1958 Soft Cover. Very Good. 12mo - over 6¾" - 7¾" tall. Garden City, NY: Doubleday Anchor, 1958. good mass market paperback. Previous owner inscription. Writing throughout.. Mass Market Paper Back. Good. U. S. A.: Doubleday, 1958. Some edgewear and creasing of spine and covers,as well age toning, & a gift note on the inside cover, otherwise still a fair reading copy. Mass Market Paperback. Fair to Good. U. S. A.: Doubleday, 1958. Edgewear and creasing of spine and covers,as well age toning, otherwise still a good reading copy. Mass Market Paperback. Fair. Doubleday. Used - Good. Shows some signs of wear, and may have some markings on the inside. New York: Doubleday & Company. Very Good in Good dust jacket. 1958. Pocket pb. To . Doubleday Publishing. Used - Good. Good condition. Owner's name on inside. New York: Doubleday Anchor, 1958. MM Paperback in color illus wraps.. VeryGood+ w a few pencil underlines & notes on endpapers, edges reinforced with clear tape.. Extensive study of the symbolic process and its function in human psychology. Nice bright tight copy. 363 pp. Condition: VeryGood+ w a few pencil underlines & notes on endpapers, edges reinforced with clear tape. NY: Signet. 1999. good+. Paperback. ISBN:0451195582 301pp; text clean; reading creases to spine . Garden City: Doubleday, 1958. Pocket book in near very good condition.. 263 pages. Condition: Pocket book in near very good condition. Garden City , New York: Doubleday & Company Inc / Anchor Books. Very Good. 1958. Paperback Pictorial. 0385093497 . A selection from the writings of C.G. Jung. Edited by Violet S. de Laszlo.363 pages.Interior is clean and without any marks. ; 12mo - over 6¾" - 7¾" tall . Doubleday Publishing, 1958. Mass Market Paperback. Good+. One emphatic crease in the spine where the book opens at page 116 binding compromised there but no loose pages, rest of binding intact, no age toning, no slant, 363 unmarked pages, edited by Violet S. de Laszlo, reading copy. Garden City, New York, Usa: Anchor Books, 1958. First Edition. Mass Market Paperback. Good. Mass Market Paperback. 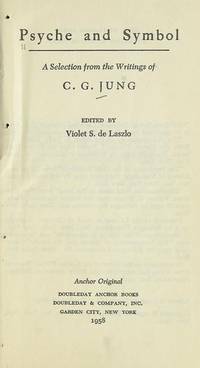 A Selection From the Writings of C. G. Jung. 363 pp in wraps. Edited by Violet S. De Laszlo. Light wear to the wraps, creasing to spine, name in ink. Doubleday / Anchor, 1958. Paperback. Good. Good Softcover. Cover is spotted. Text is clean and unmarked. Tight binding. Princeton University Press. PAPERBACK. 0691019037 Good Condition. Five star seller - Buy with confidence! . Good. Doubleday Anchor. Unbound. GOOD. Spine creases, wear to binding and pages from reading. May contain limited notes, underlining or highlighting that does affect the text. Possible ex library copy, thatâll have the markings and stickers associated from the library. Accessories such as CD, codes, toys, may not be included.